At NextProto, we are very good at producing the best quality plastic injection molded parts and rapid tooling/mold tools. Our customer always requests the fastest delivery on plastic injection moldings so we make really quick turnaround proto molds for short term pre-series production. Once you design a part, and we have made the good quality rapid prototypes for you, then you would like to try out our rapid tooling and proto mold services without choosing another new supplier. This is the best way to save cost and money! Various plastic resins can be chosen from NextProto. Our rapid tools can produce 50 to 50,000 + finished parts no matter how small or big the quantity is. 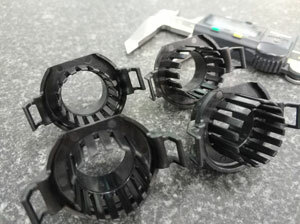 Sometimes, our robotics and automotive clients only want a few 2K mold parts done using our fast proto tooling service. The mold can be made from aluminum 7075 or P20 steel with SPI B1 to SPI A2 surface finish. Textures can be defined by VDI 3400 or Mold-Tech etc. If your part is optical standard and must be crystal clear/transparent, we will offer you SPI A3 to SPI A1 finish using NAK80 steel. Rapid tooling fills the gap between rapid prototyping and full production tooling. 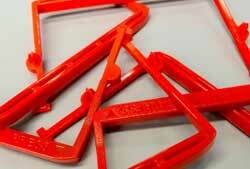 NextProto offers a quick turnaround service on P20 steel injection molds. We use a Master Unit Die which quality molds can be produced with a very short lead-time at a very competitive price. Our team can give DFM advice before production. data and drawings to providing you a quotation, this will only take 24-48 hours. After you confirm the order, you will get the DFM from our engineer for approval. Once the DFM is completed and the mold layout is agreed, including position and type of gate, ejector pins position and parting line position, we will start to make an injection mold for moldings. after you see the first off samples and we would do the mold modifications accordingly. Before "cutting the steel", we would need to have an agreement on the DFM. DFM is short for Design for Manufacturing. 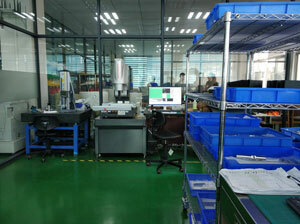 It is a normal tool to confirm all the details for Plastic Injection Molded Parts or Pressure Die Casted Parts. This will include information about basic details such as material resin, steel, mold type, cavity numbers, shrinkage rate, tolerances, inserts, parting lines, injection gate, ejector pins position, wall thickness analysis etc. NextProto provides free of charge DFM for every customers once order is placed. Sometimes, we will offer you the basic DFM in the quotation stage to help you modify the 3D CAD models. the parts as per your specification. 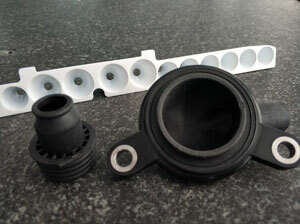 We can also provide 2 shot parts and over molded parts. We pride ourselves on our excellent communication and customer service. DFM (Design For Manufacture) is an essential part of the product development cycle. This process is always best carried out at the design/prototype stage, in order to keep overall product manufacturing cost to a minimum. We will do this for all rapid injection tooling projects and make sure all your parts suit for injection molding process.